Cravings Cookie Tins with Assorted Cookies & Brownies! 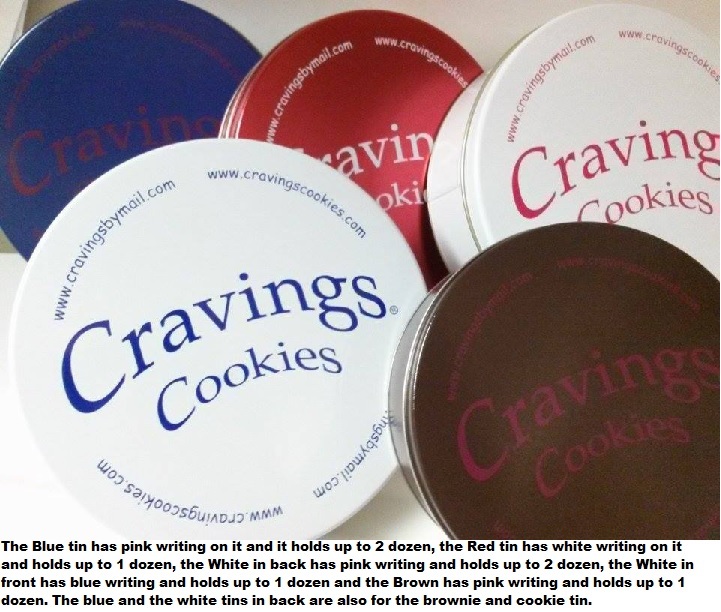 Cravings Cookie Tins with your choice of cookies and brownies in our elegant Cravings tins. Homebaked cookies and brownies from Cravings kitchen. Each selection includes your choice of brownies and Cravings cookies from our cookie selection. The assortment is your choice. Peanut Butter Brownies, Outrageous Brownies, Double Chocolate Brownies, Chewy Chocolate Brownie, Chewy M & M Brownie, Chewy Walnut Brownie. 1) Mom's Oatmeal Chewies, 2) Cravings Famous Chocolate Chippers, 3) Grandma's Molasses Crinkles, 4) Oatmeal Raisin Walnut, 5) Peanut Butter 6) White Chocolate Macadamia Nut, 7) Chocolate Chippers with Walnuts, 8) M&M Chocolate Chippers, 9) Heath Bar Crunch, 10) Cranberry Orange Oatmeal Chewie.